A leading dog-blogger offers a tour of military working dogs' extraordinary training, heroic accomplishments, and the lasting impact they have on those who work with them. People all over the world have been riveted by the story of Cairo, the Belgian Malinois who was a part of the Navy SEAL team that led the raid on Osama bin Laden's compound. A dog's natural intelligence, physical abilities, and pure loyalty contribute more to our military efforts than ever before. You don't have to be a dog lover to be fascinated by the idea that a dog - the cousin of that furry guy begging for scraps under your table - could be one of the heroes who helped execute the most vital and high-tech military mission of the new millennium. 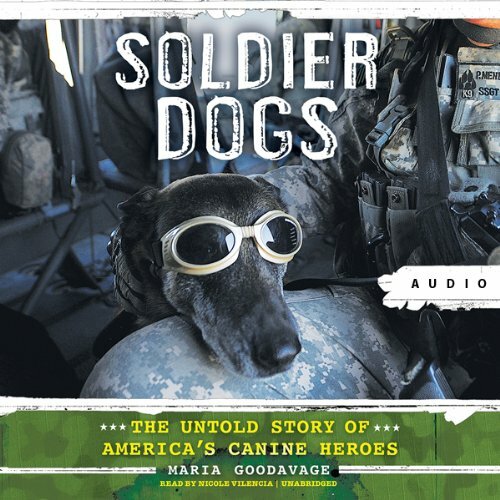 Now Maria Goodavage, editor and featured writer for one of the world's most widely read dog blogs, tells heartwarming stories of modern soldier dogs and the amazing bonds that develop between them and their handlers. Beyond tales of training, operations, retirement, and adoption into the families of fallen soldiers, Goodavage talks to leading dog-cognition experts about why dogs like nothing more than to be on a mission with a handler they trust, no matter how deadly the IEDs they are sniffing out, nor how far they must parachute or rappel from aircraft into enemy territory. Maria Goodavage, a former reporter for USA Today and the San Francisco Chronicle, is the editor and featured writer for one of the most widely read dog blogs in the world: For the Love of Dog. She is also the author of The Dog Lover's Companion to California and The Dog Lover's Companion to the San Francisco Bay Area. She co-produced and wrote an award-winning children's video about animals, starring the voice of Ed Asner.